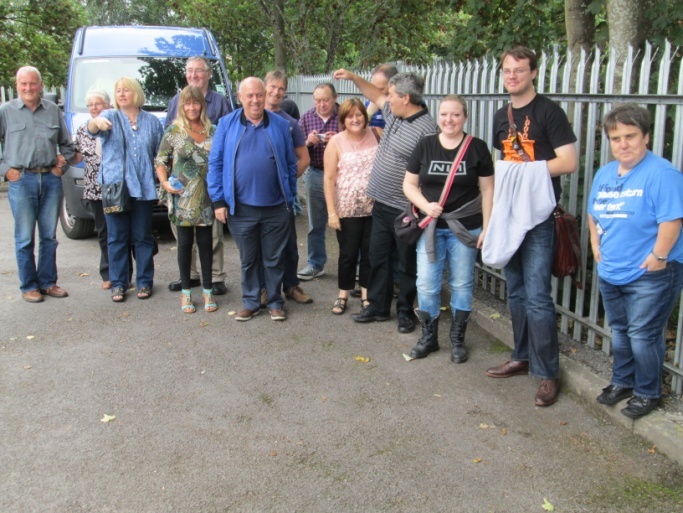 With eager anticipation and excitement, travellers on the full-to-capacity minibus headed off to the Grey Trees Brewery, situated in Aberaman, just to the south of Aberdare. On arrival, the thirsty group was greeted by the brewer, Ray Davies, who proudly lead them to the brewery bar for the first of many free pints that were kindly on offer. The previous evening, to celebrate the brewery’s first year of brewing, an open night had been held there, with more than 200 people sampling the great beers on offer. The highlight of the evening was marked by the arrival of rugby legend JPR Williams. 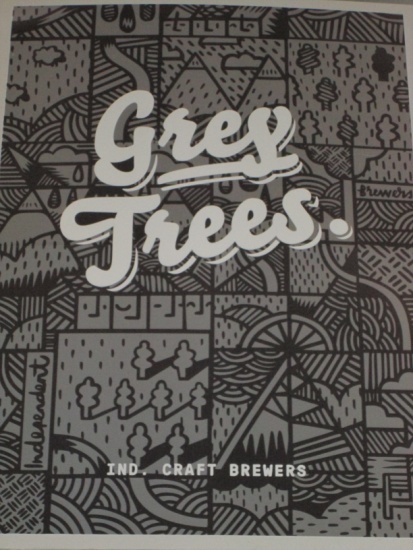 Our branch members were somewhat concerned that there may be no beer left after such a well attended evening, but Ray quickly put their minds to rest by announcing that four Grey Trees ales were there for all to enjoy. The four were (in ascending order of strength): Carradock Bitter, Market Garden, Black IPA and Double IPA – a potent 8% strong ale. John Skinner soon sampled the perks of being Chairman of the group as he headed the disorderly queue at the bar, to receive the first pint of the afternoon. The brewer then provided the group with an overview of the brewing process and a potted history of how the brewery came about and how he became involved in it. We were were also invited to relax in the very pleasant seating area adjacent to the brewery shop, where bottles of Grey Trees finest ales were purchased aplenty. After a very enjoyable afternoon at the Grey Trees brewery the, by now, slightly merry travellers bid Ray farewell after thanking him for his hospitality and boarded the minibus to set off to their next destination, Fagins Ale & Chop House in Taffs Well. Here a splendid choice of beers was sampled, the only disappointment for the party was the announcement, at 5 o’clock, that Southhampton had beaten Swansea 1 – 0! The by now very merry travellers left Fagins and headed for the Gwaelod-y-Garth, a short drive away, where they sampled their delicious cuisine on offer and, of course, topped up from the array of ales. It was well into the late evening that the party boarded the minibus and set off home, the ale and fine food by now having had time to mellow the travellers, the journey home was somewhat quieter, the silence occasionally broken by 60s songs from our Liverpudlian guest, Robby – not a bad voice at all! Everyone enjoyed and a big thanks go to Beth who organised the day, Ray the brewer at Grey Trees and also to the minibus driver for putting up with us and delivering us all home safely. The Bluestone Brewery in Pembrokeshire. On a short holiday in late September to West Wales I made arrangements to call at the Bluestone Brewing Company (Good Beer Guide 2015 p707), which is in the Gwaun Valley (Bessies etc) near Newport, Pembs. We were greeted by Amy Turner who, with her business partner and father Simon, has built up an impressive number of customer outlets (around 200) in less than a year of opening the brewery and starting production. They currently have five different brews in production which are either available in barrels, bottles or 5-litre mini-kegs, to suit a variety of pubs’ sales volumes. 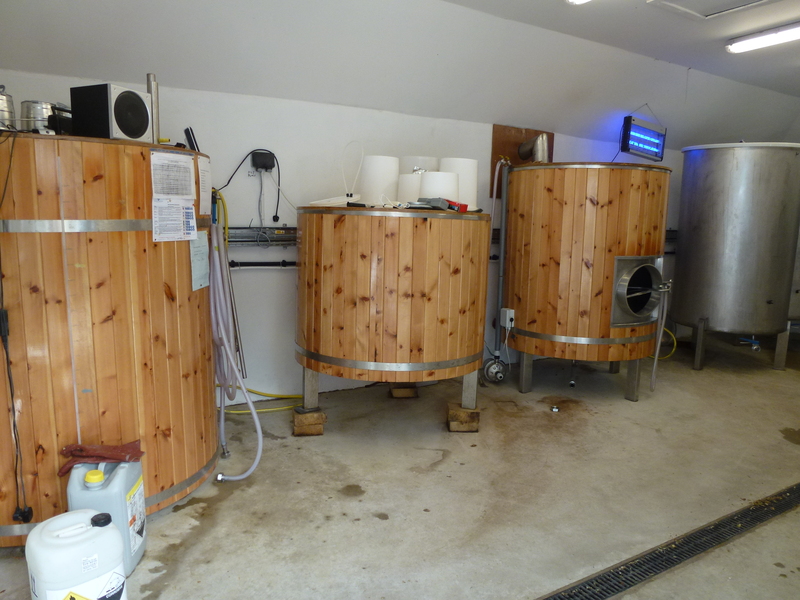 Whilst they’ve converted much of the farm buildings to brewery, office, cold store, etc, they’re finding demand, especially during the summer – thanks to the thirst of tourists – means they’re going to have to continue to convert more of the farm’s buildings to brewery use very soon. Success is all very well but it means continually spending large sums of capital! Their brewing kit is a 10-barrel outfit, which was bought almost new from sources in England & Holland (see pictures). Also Simon has a small scale experimental brewing outfit, where he perfects new recipes. CAMRA branch visits are welcome and Amy suggested that a Bluestone visit be combined with at least one other West Wales micro-brewery visit, eg Caffle in Cardigan and/or Mantle in Llawhaden. Their West Wales wholesaler Templeton has coincidentally produced a useful booklet listing the breweries in the area. I’ll be passing a copy to Beth for her consideration as part of her brewery visit planning and to Hywel to get the beers into the Ancient Briton! I was really impressed by their use of tele-marketing (Amy makes up to 200 calls to customers every Monday seeking orders) and the use of social networks, website, brochures, and use of internet card payments for off-brewery sales. 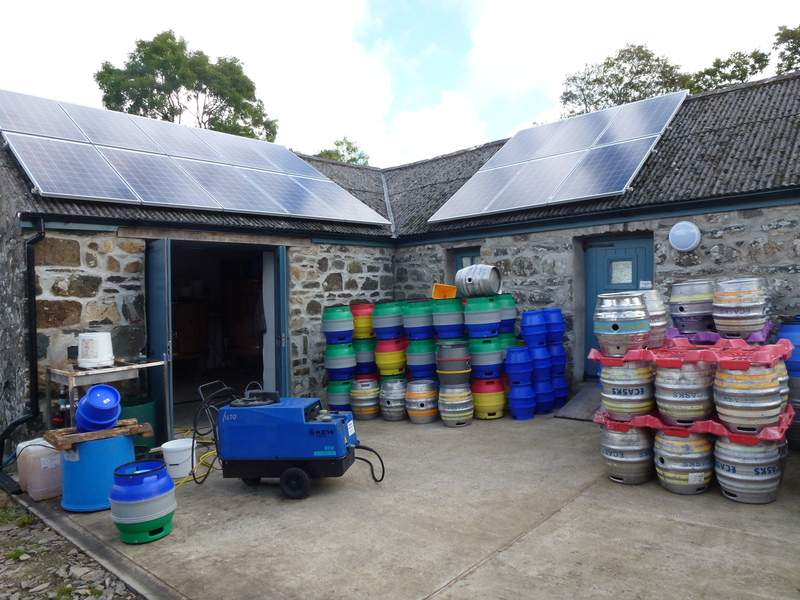 They are also environmentally friendly, and have a distinct financial advantages over competitors, in that they take their water from a Preseli Mountain well, have a 4kw photo-voltaic solar panel array on their roof, have a reed-bed waste water system – so no water rates! If using GPS to find the brewery SA45 0QW please bear in mind this might not take you directly as there some six houses/farms scattered over a quarter of a mile with the same postcode. In the recent Pembrokeshire Beer Festival, Bluestone Brewery won 1st & 2nd with their Elderflower Blond and Blond brews respectively. My impression of Bluestone was sufficiently enthusiastic that I took advantage of their 12 bottles for the price of 10 offer, bringing home a selection for Christmas. Colin, John & Howard at the Brangwyn Hall on the Tuesday setup day. The meeting was held at the Wern Fawr, Ystalyfera on 15 September. 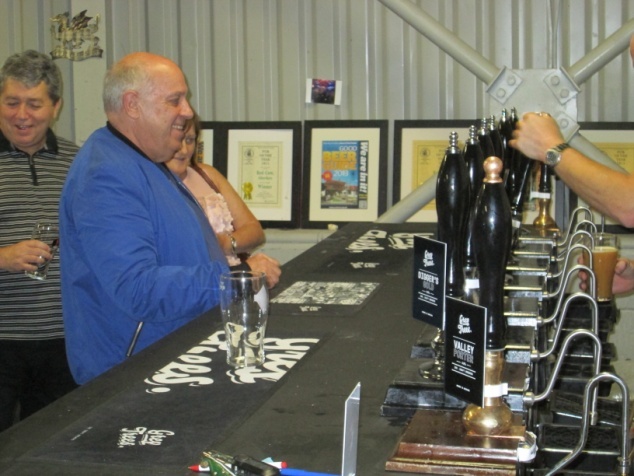 Swansea Beer Festival , August Bank Holiday – The 12 members who had offered help in the setup and serving at the Festival all turned up as promised. The branch now has 156 members on the books, up from 143. Some of the new members signed up at the Swansea Beer Festival have come the way of NPT. Various brewery visits are being planned for right through to Spring 2015. Details of the visit on 20 September visit to Greytrees Brewery, Aberdare, Fagins & Gwaelog y Garth to be passed to Colin Rees. Consideration should be given for newer members to visit the closest local breweries. The Sub Branch Christmas Tour will be on 13 December in Mumbles, followed by a curry in the St Helens area of Swansea. Neath Port Talbot CAMRA sub branch had an excellent Spring excursion to the Hopback Brewery at Salisbury. An early start was made using one of the NPT Community Transport minibuses. The plan was to arrive as soon after 12 as possible at the Hopback Brewery, which is located a few miles south-east of Salisbury. On arrival we were greeted by Hopback head brewer, Steve Wright. Appreciating that we’d all had a long journey he invited us to help ourselves to a brand new Hopback pint glass (which he said we could keep) and a choice of four barrels of Crop Circle, Summer Lightning, etc. I almost got trampled in the rush! What a welcome! Once suitably refreshed we started the brewery tour and Steve happily answered questions about the brews’ recipes, hops used (at which point Aaron Jones got quite animated, he likes hops!) etc. We were also shown the brewery’s bottling plant and were delighted to be given, (yes given, free) some of the 5-litre ‘supercans’ also produced by Hopback. Suitable contributions to the brewery’s charity – the Salisbury Hospice – were made in lieu. Leaving Steve to lock up the brewery for the rest of the weekend and promising to meet him at the Hopback brewery tap, the Wyndham Arms close to the Salisbury city centre later in the afternoon, the group then made their way to a pre-booked lunch at the 15th century pub, the Haunch of Venison. Its menu specialised in, yes you’ve guessed it, venison dishes. Delicious – and a must for any visit to Salisbury. Once further refreshment had been achieved it was time to make the short trek to the Wyndham where all of the Hopback brews were on offer. Shock horror – we had to pay for the beer this time! We again met up with Steve the Hopback Head Brewer and shared a few more beers and stories with him throughout the afternoon. All too soon it was time to leave Salisbury and hit the road back to Wales as darkness started to fall. Anyone who thought that the day’s enjoyment was over was mistaken as having reached the M4 turning to the A470 we diverted in the general direction of Castell Coch and entered the village and its namesake pub, the Gwaelod y Garth. Some of the party were flagging at this point but the sight of the pub’s welcoming lights seems to invigorate them. Despite being a busy Saturday night, once Sub-Branch Chair, J Skinner Esq., had announced our arrival the 14 weary travellers were quickly found seats by landlord Richie and wife Barbara and nuts and nibbles were on the table. Their own brews from the Violet Cottage Brewery or “The Brew with a View” were a popular choice to round off the day’s drinking, before we headed back to the M4, J45 and the Swansea Valley. Thanks to John Skinner for his immaculate organisation of the whole outing as well as to patient NPTCT driver Colin for his endurance and driving skills over a very long day, especially the necessary 200 yards reverse in the narrow, crowded roads of Gwaelod y Garth! Roll on the next branch ‘outing’. 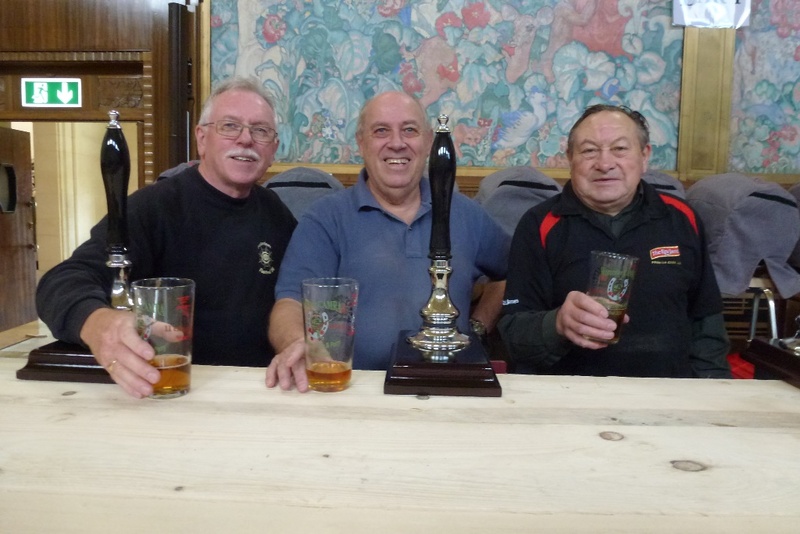 Pictured L-R, Hywel Roberts, Ancient Briton cellar manager, Ancient Briton landlord Gerald James and NPT CAMRA Sub-branch Chairman John Skinner. July 21st saw the regular bi-monthly meeting where the usual agenda items were discussed, on this occasion in quite an efficient and timely fashion, – it has to be said that it doesn’t always happen that way! There was a strong turnout of most of the usual suspects from the Swansea, Neath & Afan Valleys. 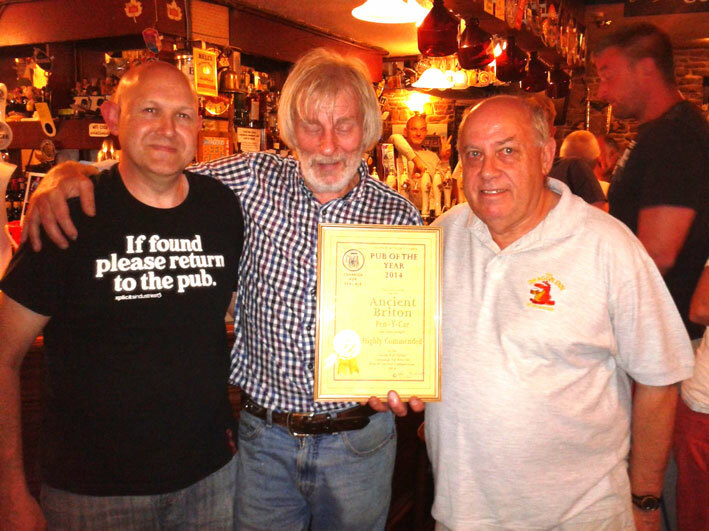 Probably uppermost in many of the attendees minds was that the event would also include the presentation of the Branch’s “Highly Commended” CAMRA Certificate in the 2014 Pub of the Year Competition, to the Ancient Briton landlord, Gerald James. This was done at the end of the meeting where Chairman John Skinner commended the attributes of the Ancient Briton despite having missed out on the top spot in the competition this year. John used his speech to confirm that the judging for the Pub of the Year was this year done according to CAMRA’s six criteria of excellence and that 13 members participated in the survey of the shortlist of three pubs. All attending agreed with John’s comment that to get the CAMRA ’Highly Commended’ Award was something many pubs would give their eye-teeth for. In accepting the award Gerald felt that he had to give his own thanks to his cellar manager Hywel Roberts without whom his pub would not have achieved its reputation for a fabulous range of excellent real ales and ciders.